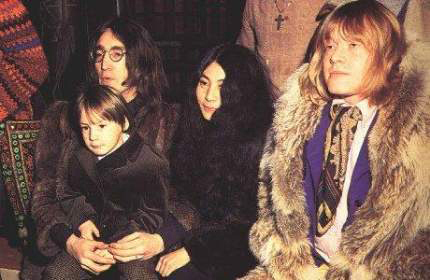 John + Yoko + Julien + Brian Jones. . Wallpaper and background images in the John Lennon club. This John Lennon photo contains 모피 코트, 모피 칼라, 모피 악센트, 모피 액센트, 밍크, 밍크 코트, 밍 크, and 밍 크 코트. There might also be 세이블 코트, 검은 담 비 코트, and 모피.